Rachel is an Oklahoma Native and got married just a few weeks ago! We still have many of Rachel’s paintings in the shop and online. We love the textural elements and uniqueness of each piece. It’s my golden birthday, so I am dreaming of all things gold! 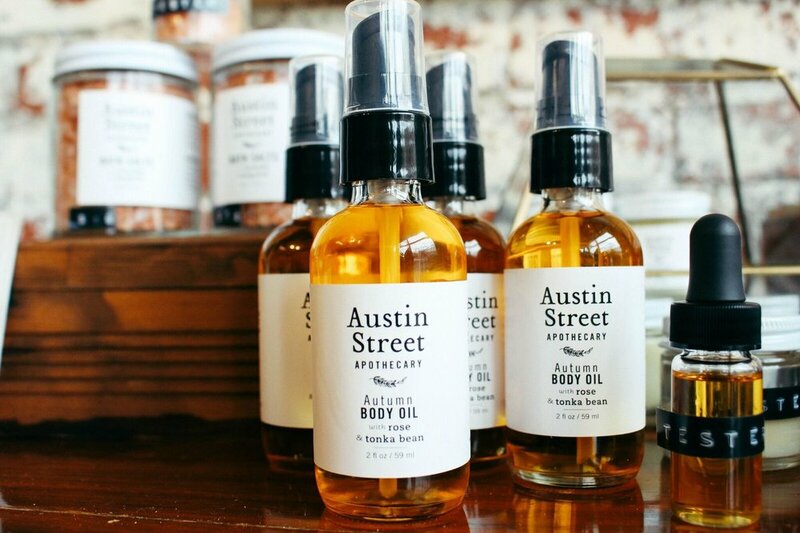 I am absolutely loving the beautiful golden Autumn body oil by Austin Street Apothecary we currently have in shop. Made of golden jojoba oil, rosehip seed oil, cardamom extract, and tonka bean, this oil is sure to change your beauty routine. All natural + organic. Each shipment we get is made fresh just for our shop. I use it as a lotion replacement. Also, it smells like what perfect fall dreams are made of. Mycah Higley’s accented golden square pieces. If you’ve ever wanted an original painting for your home, this is the pick for you. Priced at only $75, these are gorgeously layered paintings, and work beautifully as individual pieces or as a set. Vintage golden jewelry & amber antiques. This is nothing new, but lately I have been on a kick for finding the perfect new vintage piece to add to my collection. How did I just now discover Almond Champagne?? Delish! It is my choice birthday bubbly. And lastly, PSA: Sam’s now carries the beloved Halo Top Birthday Cake ice cream in a 4 pack. You’re welcome. I will probably eat all 4 today.